My wheels are spinning in place, sometimes literally and often times figuratively. I've been biking as much as my life allows these days, which means waking around 5:30/5:45 and heading out by 6:15 am to ride up and around the Art Museum and River Loops, two or three days a week. 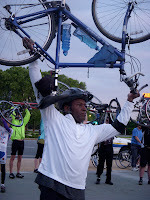 At the beginning of the month, I went to New York for the 5 Borough Bike Tour - a ride I will NEVER DO AGAIN! This time, never definitely means never again. 32,000 people riding on the Streets of New York, most of whom do not ride on a regular, annual or life-time basis is a recipe for disaster. I so disliked the event this year, that I didn't even blog about it. My displeasure was mostly with the idiots we encountered and the inability to get to basic services along with all the other riders; it put me off and I didn't want to repeat the story to anyone. I had a great time riding with my friends Ellen and Jim but the day was marred by a gang of cape wearing, wheelie popping youths, a fat slob who fancied himself Lance Armstrong who cut us off the road and knocked Jim over, and the lack of swag, grub and goodies because we couldn't reach it at the rest stops. The day was topped off with not being able to get out of the Festival unless all 32,000 of us went out the same exit. Everyone was shuttled like cattle towards the same destination of the Staten Island Ferry - the opposite direction to where I was headed. The 5 Boro Ride left me regretting doing this slow walk/ride to hell. As for other rides - biking as exercise and training, it's not going as well as last year. I feel as though I am struggling to keep up with my biking buddies. I was sick for a week and have been plagued with allergies most of April and May. The weather's been contrary lately, mostly cold and misty, making rides harder. 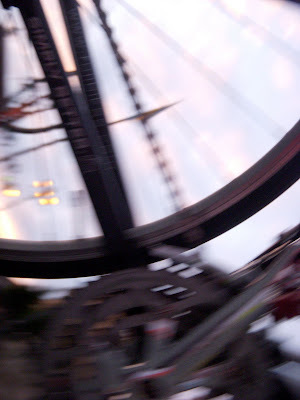 My friends are faster riders, on better bikes, so I'm more keenly aware of my short-comings. I thought maybe the harsher weather conditions would be good for the nicer weather days; giving me an edge once it's warmer and not so windy. I haven't really tested this theory out - because I couldn't ride the two nice days we had in the past two weeks. I used to fancy myself a good cyclist. Now, I'm not so sure. My pace is a solid 13 miles an hour. I was hoping for a 15 mile an hour pace ride. Not sure how I'll improve it. It's hard to get in workouts with our new "normal" life with baby. I wouldn't trade this new life, I love Nate so much but trying to fit everything in and keep up with home, work, shopping, cooking, and blogging, well, it's a lot. On a more positive, less pms-influenced note - I've am having good experiences with my SheRox Tri mentoring. I've been running at Valley Green Trail in the Wissahickon. I've met several of my mentees for coffee, riding and running. One of my mentees lives within a block of me, and we've run and biked a few times. I had a successful bike ride meet-up on Wednesday night, with 5 mentees joining me for a Bike 101 lesson. And I bought a new, beautiful collegiate style Schwinn bike, called "Coffee". The women's version is called, "Cream". I'm very happy with it, and naturally have decorated it and added a wicker basket. I'm already thinking about the Tweed Dandy Ride this fall and how I'll dress and decorate the bike. Last night was the annual Ride of Silence. It's weird to say I enjoy this gathering, the reason for its being is to honor those cyclists who were killed over the past year while biking. The event is national and from what I saw this year, growing bigger and more necessary. I still am in awe of the power of cyclists and our ability to come together en mass to show the need for sharing the road, fighting for road rights all while riding silently through 12 miles of City Streets. Vive Le Bicycle! Too bad about the NY 5 Borough being hellish. Do you remember Heather Hitchens? She was the red head that worked with Jane for a while at AMTF. Anyway she's an avid biker who's done that ride in past years, I'll have to send her your post.